Of all the games, this is the one that focuses most on the story. The previous games have all had a story behind them, but it always seemed like it took a backseat to the puzzles and the humor. In this game, the focus is greater on the overall plot, and you find yourself moving forward, wanting desperately to know what happens next. There are also a few major twists and unexpected moments, especially in the last two episodes, that left me genuinely surprised. For those of you that don’t know, episodic gaming is a simple principle that borrows from TV shows. Instead of releasing one large game, episodes are released at certain intervals–in this case once a month–at a cheaper price than a whole game. Each episode has its own self-contained story, but also fits into a bigger overarching story for the season. The episodes begin with a “previously on…” segment to fill in any details, but for this particular series, I’d say it really works best if they’re played together. That way uou get a real sense of the plot build up. The one real problem I have with episodic gaming in adventure games is the puzzle element. A smaller game means a smaller area to interact with, making the puzzles seem less difficult. The game still had me stuck at a few points, but overall, a lot of problems could be solved by walking around the environment and going over everything you could interact with. There is no sense of being in a larger world with endless possibilities that the previous games had. As for the gameplay itself, it’s very basic. Click on any object to inspect or interact with it, open your inventory and click on things in there to use with things in the environment, and of course, talk to anyone and everyone to get clues as to what you need to do. There is a hint system if you get stuck that will make Guybrush talk to himself and give out clues, but I never found it necessary. The one major change that is noticeable right off is the movement. Holding the left mouse button down and moving it in any direction will cause Guybrush to move in that direction. It’s a little disorienting at first, but becomes very easy to control after spending some time with it. There is also always the option of using WASD to move, and holding shift to run. The humor is dead on, matching that of the original games. There were actually a few moments where I found myself laughing out loud, which is a rarity for me. The characters, both old and new, play off of each other very well giving the game a feel of an engrossing story rather than just a bunch of one liners about pirates. There are also a lot of references to the older games throughout the chapters, whether through music or certain lines of dialogue. These are mostly done in a subtle way, and are easy to miss if you’re not paying attention. Only once or twice I felt they were trying too hard to say, “Hey, remember this from the first game? Good times.” A sense of nostalgia let me forgive these moments, but it does take you a little out of the current game. The voice work is excellent, with most of the original actors taking up their major roles again. Guybrush’s voice actor, Dominic Armato did an amazing job showing a much wider range of emotions in this game than in any of the previous ones. There are also a lot of new characters introduced, but only two, maybe three of them are memorable. In order to save game space, a lot of character models are reused. So often when you talk to someone, you’re not sure whether you’ve met this generic tall pirate with an eyepatch before or if this is a completely different generic tall pirate with an eyepatch. The new characters that have major roles in the story are well developed and feel like they belong in the games universe alongside some old favorites, some of which also make a return. Mutton Chops and pirate hat? Hmm, not sure if I’ve run into you previously. 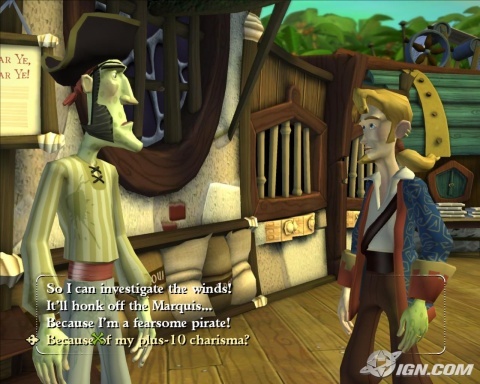 Tales of Monkey Island is the game I’ve been waiting for to continue the Monkey Island series for over ten years. Longer, actually, since I didn’t care for the fourth game all that much. The characters are everything you would want in a pirate game, the story is excellent, and the difficulty is well balanced keeping the player from becoming either frustrated or bored. I’d recommend it if you’re a fan of the series, or just looking for something fun to play. Telltale also left themselves open to make more games in the series, and if they do, that is going to be a day one purchase for me if it will be as good as this season was. All five episodes are available to purchase at The Telltale Games Store. They are also available on WiiWare, and will be coming to Xbox Live in the future. 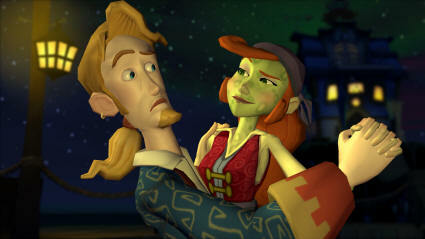 Check out A Look Back on Monkey Island for a review of the older Monkey Island games. Might help you get some of the inside jokes in this current release.